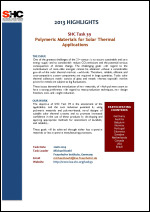 Task 39 ”Polymers for Solar Thermal Applications“ of the International Energy Agency’s Solar Heating and Cooling Programme (IEA SHC) was a joint endeavor by polymer and solar thermal experts from industry and research. It started in 2006 with a variety of studies on polymeric materials’ suitability for the application in solar heating components. 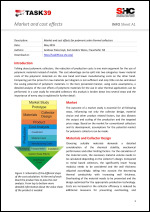 Investigations on novel designs that allow for alternative materials were elaborated as well as accompanying studies on the cost-reduction potential resulting from the efficient combination of material and product design. 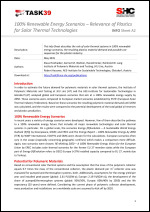 In order to estimate the future demand for polymeric materials in solar thermal systems, the Institute of Polymeric Materials and Testing at JKU Linz (AT) and the AEE-Institute for Sustainable Technologies in Gleisdorf (AT) analyzed global and European scenarios that aim at a 100% renewable energy supply by 2050. Those scenarios were compared to European market scenarios established by ESTIF (European Solar Thermal Industry Federation). Based on these scenarios the resulting polymeric material demand until 2050 was calculated, and the results were compared to the potential development of the total global oil reserves and plastics production. Talking about polymeric collectors, the reduction of production costs is one main argument for the use of polymeric materials instead of metals. This cost advantage can be split into two categories: lower material costs of the polymeric materials on the one hand and lower manufacturing costs on the other hand. Comparing just the prices for raw materials per kilogram is not sufficient and only little can be said about the saving potential of polymeric materials. 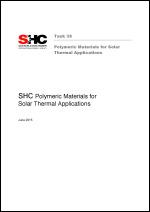 In the here presented manner, using some assumptions, a detailed analysis of the cost effects of polymeric materials for the use in solar thermal applications can be performed. 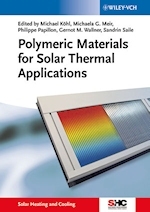 --- Bridging the gap between basic science and technological applications, this is the first book devoted to polymers for solar thermal applications. Clearly divided into three major parts, the contributions are written by experts on solar thermal applications and polymer scientists alike. The first part explains the fundamentals of solar thermal energy especially for representatives of the plastics industry and researchers. Part two then goes on to provide introductory information on polymeric materials and processing for solar thermal experts. 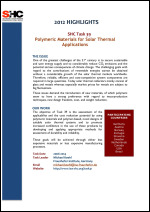 The third part combines both of these fields, discussing the potential of polymeric materials in solar thermal applications, as well as demands on durability, design and building integration. With its emphasis on applications, this monograph is relevant for researchers at universities and developers in commercial labs. --- Der wachsende Markt für solarthermische Anlagen ermöglicht den Einsatz von Polymermaterialien, die durch kostengünstige Massenproduktion ein großes Kosten- Einspar-Potential aufweisen. Sie sind allerdings nur einsetzbar, wenn ihre Gebrauchsdauer vergleichbar mit denjenigen konventionellen Produkten ist. By: Meir, M., Brunold, S., Fischer, S., Kahlen, S., Koehl, M, Ochs, F., Peter, M., Resch, K., Wallner, G., Weiss, K.-A. and Wilhelms, C.
By: Ruesch, F., Brunold, S.
--- Der wachsende Markt für solarthermische Anlagen ermöglicht den Einsatz von Polymermaterialien, die durch kostengünstige Massenproduktion ein großes Kosten-Einspar-Potential aufweisen. Sie sind allerdings nur einsetzbar, wenn ihre Gebrauchsdauer vergleichbar mit derjenigen konventioneller Produkte ist. 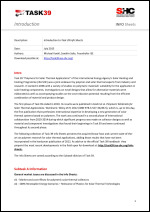 Zu diesem komplexen Themenbereich wurde die Task 39 des Solar Heating and Cooling Programme der Internationalen Energieagentur konzipiert. --- Wie Entwicklungen in anderen Industriesektoren (z. B. Elektro- und Elektronik-, Automobil-, Bau- und Verpackungsindustrie) eindrucksvoll belegen, ist auch in der Solarindustrie ein hohes Potenzial für innovative Weiterentwicklungen von Komponenten und Systemen durch den verstärkten Einsatz von Kunststoffen zu erwarten.